It’s Friday night and I’m watching the Spurs, professional athletics most boring team. I have shared with you, dear readers, the letter Gregg Popovich, the Spurs coach, and a man otherwise known as Pop, writes to each new player on the Spurs, AND things in the world as boring as the Spurs. But what I haven’t shared with you is what happens at halftime of every game the Spurs play. Well, first, you should know that when you attend a Spurs game you are encouraged to dress comfortably. I’m not talking jeans and a t-shirt, I’m talking pajamas. The Spurs organization, like any NBA organization, encourages the fans to get loud, stand up, clap, cheer, yell, shout … But unlike other NBA organizations, the Spurs have a second reason for this noise from their fans. They want them pooped out. That way, when it’s halftime, and the lights dim, the “pump up the crowd” music changes to artists like Keane, Nick Drake and Charlene Soraia and the concessions stands switch to selling warm milk and one cookie … ok, fine you can have two. But only because you asked nicely! If you are wealthy there’s an added halftime treat – Tim Duncan brings around a teddy bear for all courtside ticket holders. What’s more, he actually made the teddy bears himself. The second half is starting now, so I’d better pay attention to the game. Remember, there are only 437 more NBA games until the finals begins. 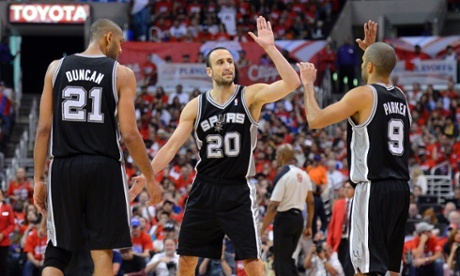 In addition to their other efforts, Spurs teammates stick to air high fives to reduce the volume.